My interest in Woodchopping started about 1969 at the annual Police Picnic when a work mate walked past me with an axe in his hand. From that day and with some coaching he entered me in the Police Chops at the Royal Melbourne Show. Ever since I have been a captive to competition woodchopping. I guess not only was it a very personal desire to master the sport, if that is possible, but also I was amongst a group of men who were dedicated to their sport. Not long after this, around 1972, the Woodchopping Chairman Mr John Gardiner, asked if I would be a Judge at the Royal Show Chops that I accepted with great pleasure. Starting off in the Ring was a great experience and where I met axemen from all over Australia and New Zealand. Being born with the “gift of the gab”, not only did I learn the sport but made many life-long friends. Sadly over the years many have moved on and with them went their experiences in the area and the history of our great Australian sport. In the Judges box I have worked with many dedicated Councillors and Judges who have given freely many hundreds of hours of their time to make the sort the success it is. Over the years I have seen many changes at the Show and possibly the best has been the introduction of Video judging and the formation of the Disputes Committee, the latter in which disputes are assessed by their fellow competitors. For myself, the culmination and success of the 1985 Royal Show International Woodchopping Festival, where we had forty overseas axemen attending, was a great credit to all the active participants, the Woodchop Committee, Judges and Stewards. In addition was the assistance given by the Show Society when I organised two Axemen’s Tours to the United Kingdom. To be able to take sixteen men and their wives, to see the reception by the English to these wonderful sportsmen, was a truly remarkable and rewarding experience. I personally believe that comradeship in the arena whether win, lose or draw is unique and as such should make the Australian Axemen truly proud of themselves and their sport. In 1980 I was awarded the Royal Show President’s Gold medal for services to the Show and our sport. For me this was an honour indeed. Again this year to be made an Honorary Life member of the Royal Agricultural Society is indeed something my family and myself are exceedingly proud of. Health holding good, I hope I may be amongst you for many years to follow. Val Quanchi joined the Victorian Police Force in January 1950. 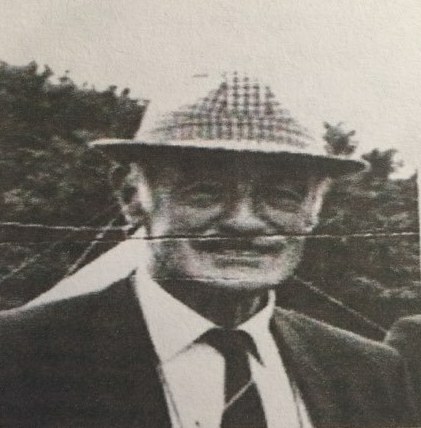 Retired Chief Inspector Jan 1987. First started chopping at the 1968 Annual Police Picnic and was in second place in the Senior Constables event. Won first two chops at Police Championships at Royal Melbourne Show 1968 and then entered open competitions. Val won many novice events over the next 4 years and in 1972 won his first open event at Gembrook. 1976 Val was Reserve Champion in the 350mm Underhand Championship Australasian Police Forces Championship defeating current champion Jack O’Toole. 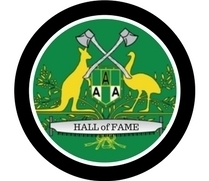 In 1972 invited by the Royal Agricultural Society of Victoria to be a judge at their annual woodchop competitions and since holding the position of Deputy Chief Steward for many years. In all 37 years services to the Society. 1992 R.A.S. Presidents Gold Trophy. 1989 Life Member Central Victoria Axemen’s Association. 1981 invited and attended the Jakarta Highland Games, Indonesia as manager of an Australian Axemen’s Team. 1982 initiated an international woodchop competition culminating in the International Timber Festival at the 1984 Royal Show. Realising the potential of the sport as an usual and truly Australian sport at Val’s own expense in 1979 took and Australian team to the Untied Kingdom and Germany. Highlights of this tour was performing 4 days in the main Grand Ring of the Royal Show of England. 9 years later in 1988 was invited to return again. Val believed in affording the opportunity to ordinary axemen, who Val personally selected to travel overseas and reward them for their personal contributions to the sport and attributes of sportsmen and ambassadors. Resulting in the attendance of overseas axemen to Australia. 1983 Val had a triple heart by-pass. Again in 1989 a quadruple by-pass followed again by two further operations for by-passes and aorta replacement. Throughout this period continuing to woodchop and remain fit and healthy. Val training many young police axemen at his home and spent any weekends in the bush cutting down trees and trimming chopping logs. He is a keen collector of old axes and crosscut saws for preservation of these historical items of which are apart of our past timber industry and sport. he is also a collector of newspaper reports, items, articles on the sport and anything related to preservation of this sport for future generations. Sadly Val passes away on Friday 17th October 2008, one month after his nomination into the Australian Axemen’s Hall of Fame. Note: Val Qaunchi joins Mr Ron Costin as an Honorary Life Member – Ron is approaching his 45th consecutive show.